You may have seen the photos of two rattlesnakes “standing up” next to each other. Half of their bodies are up off the ground, rising from the grass or brush. It looks like a beautiful mating dance, but the reality is even more dramatic. Those rattlesnakes are actually two males in combat. A third snake, which is female, will be somewhere nearby. A great example of rattlesnake combat. If two male rattlesnakes meet while tracking a female rattlesnake, they may begin this combat. The males will raise their heads up together and begin to wrestle. They’ll twist together and try to knock each other against the ground. They might fight for seconds or many minutes, but the winner of the battle will stay and mate with the female rattlesnake. The losing opponent will generally flee. Another example of rattlesnake combat. Sometimes, a young male will approach an older, larger male who is sitting near a female. The older male might chase the younger male away without a fight. We saw one instance where an older male chased a young male off of a small cliff and into a tree. It seems counterintuitive. Why would rattlesnakes wrestle when they have extremely potent venom? Rattlesnakes are more social than many people realize. They don’t usually bite each other (of course, there can be cases of rattlesnakes biting each other if they confuse a snake for the prey they are tracking). Plus, there’s no reason to waste venom that’s needed for protection against predators and catching meals. Many animals have rutting behavior that is not meant to seriously injure or kill their opponent, but show who’s toughest. So what do mating rattlesnakes actually look like? 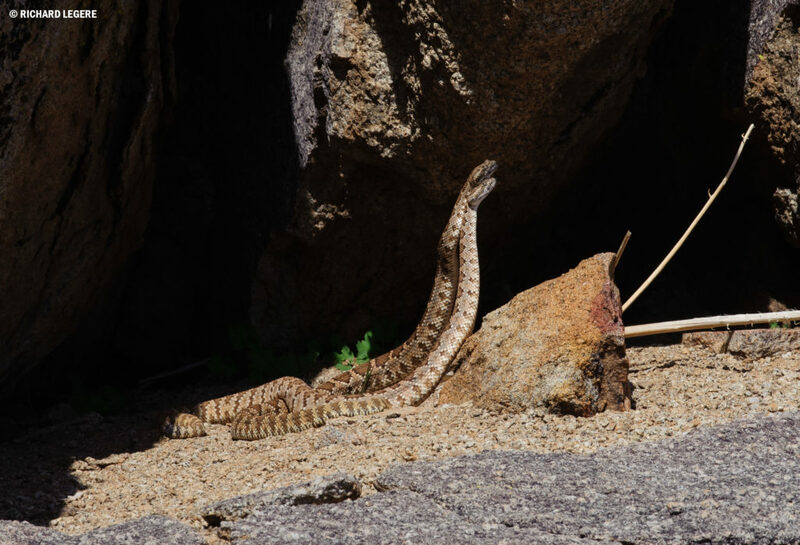 There is a real mating dance that amorous rattlesnakes perform. The male will do a twitching dance with their head against the female. The rattlesnakes will flick their tongues and flip their tails. This dance happens on the ground, without any of the upright posturing that combatting males do. If you see two males fighting in your yard or on a trail, be on the lookout for the nearby female. Do not approach the rattlesnakes and do not let your children or dogs go near the snakes. This is just one more example of the highly social nature of rattlesnakes.